We are in the throes of a major ice storm here. I'm anticipating losing power as it's really coming down out there. Cell phones are charged, bought batteries for flashlights, am washing clothes as I write - will probably want plenty of clean wool socks to wear - and stocked up yesterday on kerosene for the lamps. DH wanted to use the propane heater for the house but hehehehehehe the tanks are frozen to the ground. Soooo I guess we'll have to use the kerosene heaters instead if need be! If I get a chance and the power is still on later I'll post pics of the great out doors, the digital camera is currently charging. 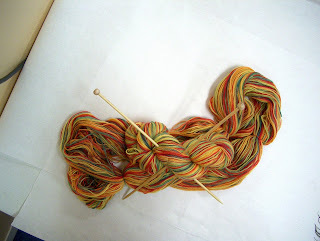 Here's some of my hand-dyed yarn, Loretta calls the colorway Clown Snot, I think of it as being more the colors of chicklets gum - remember that stuff!